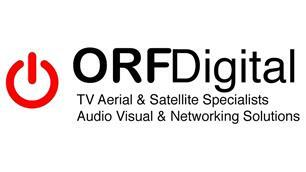 ORF Digital - TV Aerials/Satellite Services based in Bean, Kent. Welcome to the ORF Digital Checkatrade page. We are a small business that provides a fast friendly service that you can rely on. We cover all aspects of work including new installations or the service, maintenance and repair of existing systems. Our expertise is in TV Aerial & Satellite TV including SKY+HD SKY Q and European Satellites, Wi-Fi signal improvements and full distribution systems, Network cabling and sockets, all CCTV installations, Communal IRS Systems, TV Wall Mounting and Cable management, Telecommunications including new phone sockets and full systems, Audio Visual services like HI-FI, Surround Sound, HDMI and all other Home Technologies. We are proud to say that customer satisfaction is our priority and our mission is to provide you with a great service you can trust to get the job done right every time. You can also check out our Facebook page for more information news and photos.